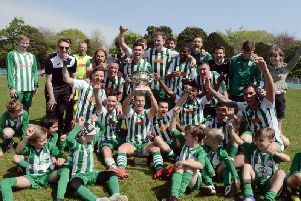 Burgess Hill Town boss Ian Chapman has been delighted with the impact new coach Simon Wormull has made to his side. The ex-Crawley Town and Eastbourne Borough player was brought into the Hill coaching set up last week and has already overseen two consecutive victories for the Hillians. Chapman feels Wormull’s man management skills have been a huge boost for his side and feels he is a already a ‘great attribute’ to Burgess Hill Town. He said: “Simon came down on Tuesday to see us against Faversham (in the Velocity Trophy) and met the lads for the first time and took training Thursday. “He’s a good coach and he’s got a nice demeanour about him. Sometimes at a football club you do need someone who has got that rapport with the players. The Hillians are currently on a two match winning streak after picking up a 2-1 away win in the Velocity Trophy against Faversham Town last Tuesday, before following it up with a 1-0 home win in the FA Cup on Saturday against Folkestone Invicta. Despite their good cup form, Burgess Hill remain winless in the Bostik Premier after six games and Chapman now wants his side to reproduce their cup displays in the league. He added: “In the last two games we’ve worked really hard as an outfit and we’ve got our rewards so we must keep it going. “We’ve put in two good performances in the cup but we’ve now got to take that into the league programme. The Hillians face Folkestone Invicta again on Saturday, but this time away (3pm kick off). Hill will also face National League South side Hampton & Richmond Borough in the second qualifying round of the FA Cup. Chapman’s men will travel to the Beveree Stadium on Saturday September 22.